Winter is upon us. With it comes weapons and abilities wrapped in Balefire – frozen to the core. 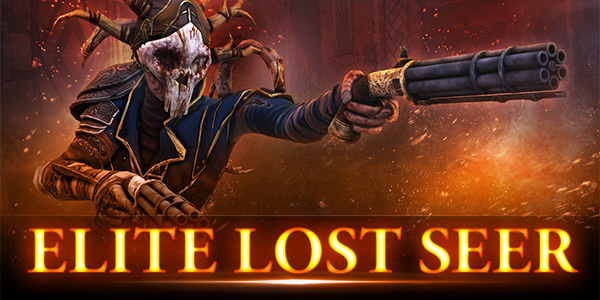 Today we also say hello to the Elite Lost Seer Skin, which you unlock by reaching level 25 with your Prophet! Lag across quite a few servers has been a bit of an issue for a while now, today’s update should return latencies to normal. We’ve got plenty of other updates and improvements on the way as well . After incorporating some changes based on community feedback into the design, we hope you like it ! Last edited by Oghamsmith; 18th Dec 2015 at 18:46. Last edited by Vampmaster; 18th Dec 2015 at 16:57. Last edited by Ysanoire; 18th Dec 2015 at 18:28. Last edited by IizGrohiik; 18th Dec 2015 at 18:01. This new patch is a , now the game crash EVER and I be banned because of crash without the option of reconnect... a really , congratulations... I cannot go to Blood Rank for YOUR FAULT!!! Last edited by IizGrohiik; 18th Dec 2015 at 21:09. Last edited by Ygdrasel; 19th Dec 2015 at 01:25. Last edited by Ysanoire; 19th Dec 2015 at 03:15. I just played two matches, but it was way more stable Good job !